The term “big club” is oft used by football supporters regarding their club, and there are often some delusional supporters who believe their club is much bigger than it is. Finance may be a key factor that allows some fans to believe their club falls in to the category of “big club”, but finance is temporary, and while (some) clubs can indeed grow bigger with the help of cash, in many cases there are a number of other factors that define the true size of a club. The draw, or pull that a club has, is a far bigger indicator of its size than how much cash is sitting in its bank account. How a club conducts itself is also very important, as is how its fans conduct themselves. When one hears of Celtic’s Peter Lawwell claiming that Celtic would be the biggest club in Britain if they played in the English Premier League, one is reminded how an inferiority complex can drive a delusion which has no basis in fact, just in order to try and remedy those feelings of inferiority. Let’s not forget, Peter Lawwell knows only a world where Rangers have accumulated trophy after trophy in Scotland, and have led the way in this country since we were formed for sporting reasons in 1872. Like the vast majority of Celtic fans, Peter only knows second. Celtic aren’t even the biggest club in Glasgow, never mind the UK. Even while Rangers recover from the trauma of the last few years, we are still drawing the largest away support in Scotland; still attracting the biggest TV audiences on every channel, still selling more season tickets and still generating more interest in every sphere than our inferiority complex-ridden rivals, with their inferior trophy room. That inferiority bleeds through Celtic Football Club, and it could well be for this very reason that Celtic Officials in the 70s, 80s and 90s decided that, rather than deal with the Celtic Boys Club Child Abuse scandal by immediately reporting allegations to the police, they felt it more appropriate to cover it up, thereby allowing further victims to suffer. It is to Fergus McCann’s credit that he took on the issue head on, where his predecessors had failed a generation of young footballers. Along with his “Bhoys against Bigotry” initiative, McCann was a breath of fresh air across the city, and one wonders, why he has been the only figurehead at the club to acknowledge these two huge stains on the club, and make an attempt to address them. 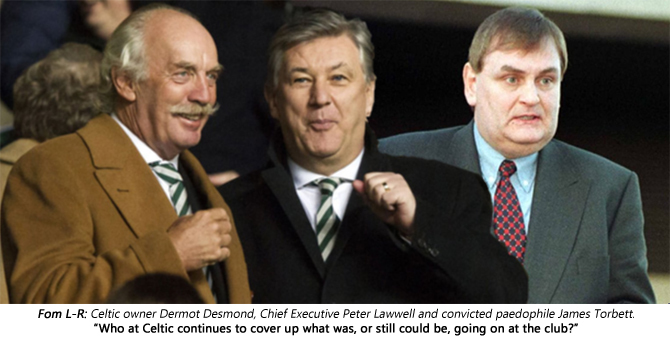 Of course, we all know the sordid details of the Celtic scandal, and the involvement of Jim Torbett and Frank Cairney, with both individuals alarmingly allowed to stay around the periphery of Celtic long after allegations had been made and swept aside by the old Celtic board. The failure to act, and the disdain with which victims’ families were treated was Celtic’s biggest crime. It is to Scotland’s shame that more wasn’t made of Celtic’s conduct during this shameful period, as it is now becoming clear that there were predators similar to Torbett and Cairney at work in England. Had the Celtic scandal been given the profile it deserved, and the club appropriately punished rather than ignored and swept under the carpet by a Scottish Media, the headlines could have forced clubs across the land to review their own operations and put measures in place to ensure the safety of all young players in the game. As the child abuse in football scandal in England broke, it was clear that this was going to become a catalyst for victims across the UK to have the courage to report further indecency, and so it has transpired. The shame is it’s only happening now rather than 20 years ago. Sadly, one of the former coaches alleged to have been an abuser is one Gordon Neely, who worked for Hibs and Rangers. The facts are unclear at this stage, with early reports suggesting that Rangers sacked Neely and reported him to the Police following him allegedly making an inappropriate remark to a young player at Rangers. His career afterwards is decidedly sketchy but it appears that he never worked in football again. If these initial reports are accurate, Rangers have conducted themselves in the manner befitting a great institution, by involving the police at the first opportunity. It is to Scotland’s shame again, that upon this news breaking alongside the scandal in England, the media here appear to be trying in some way to implicate Rangers and redress the balance after years of attempting to defend Jock Stein and Celtic officials, who were alleged in court, to have covered up child abuse at their club. With the scandal growing day by day in England, the Scottish media are suffering from collective amnesia with regards to the Celtic scandal. It’s a very strange approach from the mainstream media in Scotland, with some newer reports failing to mention Rangers reporting the allegations to the Police, and it seems once again, that protecting the name of Celtic, and attacking all things Rangers, is actually more important to some, than actually weeding out the cancer of child abuse in boys football. I sincerely hope that any victim is given the courage to come forward, no matter what football club had the duty of care, that all victims get the justice they deserve, and that we finally see the moral outrage in Scotland that has been suppressed and shouted down for the last 20 years.